The conclusion is comically implausible, but the preceding two hours are thoroughly engaging. 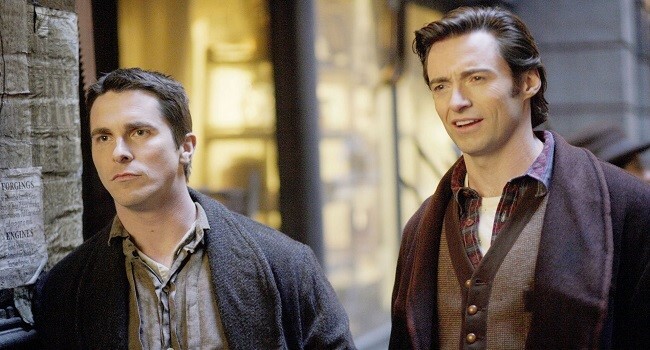 Ultimately, like so many of Christopher Nolan’s films, ‘The Prestige’ is ridiculous and far-fetched. The story twists in a way that beggars belief, in a way that’s so desperately lacking in plausibility that one asks themselves ‘Did I hear that correctly? Has it really just gone in that direction?’ Thankfully, this occurs at the end of the film, the preceding two hours produce, generally speaking, a delightfully realistic, taut and human period drama that engrosses far more than I expected. The film follows two magicians Roger Angier (Hugh Jackman) and Alfred Borden (Christian Bale) whose rivalry becomes so bitter and intense that it escalates to deception and violence. Their desperate attempts to exceed each other are genuinely engrossing, especially when Borden first develops ‘The Transported Man’. Angier and Borden’s romantic partners, Olivia Wenscombe (Scarlett Johansson) and Sarah Borden (Rebecca Hall) respectively, are dragged into the acerbic rivalry, resulting in betrayal, adultery and depression. Indeed, the aforementioned twist is a vital device that makes the film, in the writers’ minds at least, ‘work’, which means the film is rather flawed. The climax undermines everything that made the film good, but those two hours soften the blow considerably. All performances are solid, particularly Rebecca Hall’s, who has a real, sweet naturalness about her that struck me as soon as she graced the screen. Christian Bale’s accent takes at least 40 minutes to get accustomed to, it has an odd, contrived strain to it that normally only appears in interviews. As everyone knows, he’s British, but I think his true accent was lost in Hollywood a long time ago, I’m no longer sure what his real accent is, and I don’t think he does either. The film becomes increasingly overwrought as it approaches its risibly stupid climax, however I think the film’s merits overpower this, making it an enjoyable but not great film.